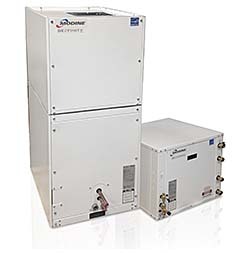 Light commercial geothermal product line includes water-to-water, water-to-air, water-to-air/water combination, and split condensing/air-handling systems. Full color LCD touchscreen provides control of up to four forced-air zones as standard, real time displays of EER and COP estimates, water and air temperatures, and troubleshooting. All systems use R410A refrigerant.